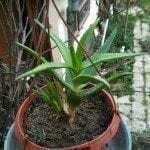 I would like to know why my aloe vera plant does not have sticky substance when I squeeze or cut the leaf. When I squeeze the leaf, I only see non-sticky white substance inside and water. Is my plant a true aloe vera? Can I eat this aloe vera leaf without sticky substance? I have learned that aloe vera leaf should have a sticky substance. Wikipedia lists 550 different species of aloe, so it is highly possible that your plant is a different specie than A. vera. I would not ingest or use the plant until you can get a positive identification.